The study resulted from a postdoctoral research project and a research internship abroad, both with scholarships from FAPESP. 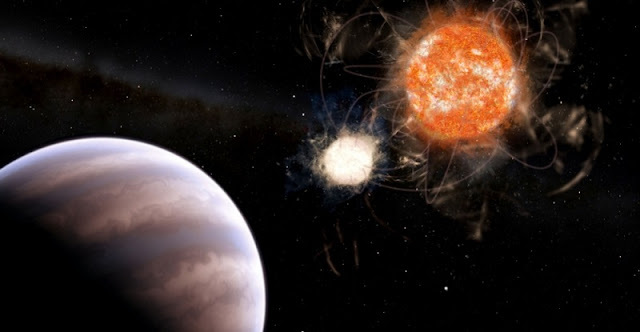 Its findings have just been published in The Astronomical Journal, owned by the American Astronomical Society (AAS). The article “Orbital period variation of KIC 10544976: Applegate mechanism versus light travel time effect” (DOI: 10.3847/1538-3881/ab0963) by Leonardo A. Almeida, Leandro de Almeida, Augusto Damineli, Claudia V. Rodrigues, Matthieu Castro, Carlos E. F. Lopes, Francisco Jablonski, José D. do Nascimento Jr. and Marildo G. Pereira can be downloaded from The Astronomical Journal at iopscience-iop-org-443.webvpn.jxust.edu.cn/article/10.3847/1538-3881/ab0963/pdf.